The Environmental Protection Agency plans to increase fuel efficiency standards for vehicles by 0.5% a year, a leading Democrat senator said Wednesday — a goal higher than the agency's original proposal, but significantly lower than rules finalized by the Obama administration. The EPA's planned fuel economy standards are "10 times weaker" than current rules, said Sen. Tom Carper, D-Del., the ranking member on the Environment and Public Works Committee. The reveal came during the confirmation hearing for Andrew Wheeler, the acting administrator of the EPA who President Trump nominated for the top job in November. The testy hearing changed little about Wheeler's likely confirmation, but it revealed new information about how the EPA plans to scale back the vehicle fuel standards and highlighted growing concern among Democrats about climate change and proposed changes to EPA mercury regulations. A confirmation vote in the EPW Committee, which approved Wheeler as deputy administrator last year, is expected in early February. 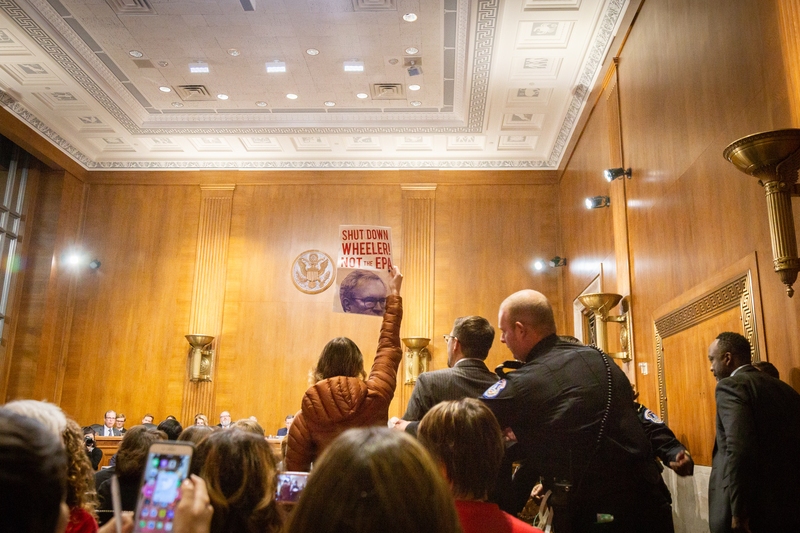 Multiple environmental activists attended Wheeler's confirmation hearing on Wednesday to voice their opposition to his nomination. Under the Obama-era fuel rules, manufacturers of cars and light trucks would have to attain nearly 52 miles per gallon on average across their models by 2025. The Trump EPA in August proposed to freeze the standards in 2020 at less than 37 mpg, but Carper said the agency would amend that plan when it files its finalized regulations. "Actually, what this administration says is [efficiency] increases of 0.5% per year and eventually just flat, no increases," Carper told reporters after the hearing. "The auto companies are saying that's not what we're asking for. They're saying we're asking for near-term relief in return for later on ramping up the standards. They know that's where the market is going." The EPA's move would also rescind a waiver used by California and twelve other states to set higher fuel economy standards than the federal government. Wheeler said he had met with California's head air regulator, Mary Nichols, on three occasions to negotiate a deal, but Carper pushed him to do more. "If I were you I would have her in my office. I would be in California. I would be trying to make this deal," he said, warning that failure to reach an agreement could result in years of litigation. "Nobody wants a 50-state deal more than I do," Wheeler told senators. "I haven't given up hope yet, but we're also looking at the calendar and know we have to finalize our proposal by March 30. We're running short of time." 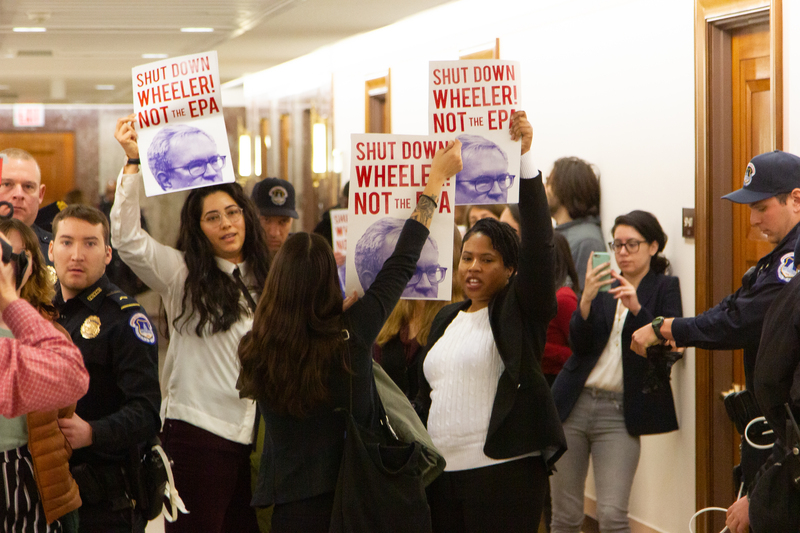 A handful of environmental activists disrupted Wheeler's confirmation hearing, shouting "Shut down Wheeler, not the EPA!" Carper and other Democrats also criticized Wheeler's decision to reconsider the rationale behind the Mercury and Air Toxics Standards, Obama-era rules on toxic air emissions from power plants. Though the standards remain in place, the ranking member expressed concern that some plants may turn off their emissions control technology if the underlying justification behind the rules is eliminated. Wheeler told senators that would not happen. "I do not believe that a single piece of mercury control technology will be removed from any power plant," he said, "under our preferred option." "This is a disgrace!" one man yelled about the shutdown hearing as he was removed from the room. A number of Democrat senators also pushed Wheeler on climate change. Sen. Bernie Sanders, I-Vt., asked Wheeler why he did not mention climate change in his opening statement "when the environmental community thinks it is the greatest crisis facing the planet?" "I would not call it the greatest crisis, no sir," Wheeler responded. "I think it's a huge issue that needs to be solved globally." Sanders also pressed Wheeler on whether he thinks climate change is a "hoax," a term used by President Trump to describe the issue in the past. "I have not used the hoax word myself," Wheeler said. "I believe climate change is real. I believe man has an impact." Sen. Cory Booker, D-N.J., and Sen. Ed Markey, D-Mass., questioned Wheeler about the findings of the National Climate Assessment, a November 2018 report from EPA and 12 other federal agencies that warned climate change poses dire economic risks to the U.S.
President Trump previously said he does not "believe" the findings of the report, a statement Wheeler said referred to "media reports on the assessment." "I question the media reports as well," Wheeler said, reiterating his argument from November that journalists focused on the "worst case scenario" in the report. Wheeler declined, however, to say whether he agreed with the topline conclusions of the report itself, saying he only had one briefing on the assessment since its release. "[Staff] gave me a number of background info to read and we scheduled additional briefings on it for early January, but those have been postponed" due to the government shutdown, Wheeler said. That explanation displeased Markey, who called the admission "disqualifying." "That's unacceptable," he said. "You're looking to be confirmed as the head of Environmental Protection Agency, and we're having a hearing on your worthiness for this job and you very conveniently haven't had enough time to view whether or not there's an extra level of urgency to this problem." Protestors continued to chant outside the committee hearing room until they were forcibly removed by Capitol Police. Wheeler argued that EPA is meeting its obligation to address climate change with its Affordable Clean Energy (ACE) rule, which it proposed in August to replace the Clean Power Plan, a more stringent carbon rule for power plants from the Obama administration. Wheeler repeatedly said that EPA career staff estimate that the ACE rule will cut carbon emissions from the power sector 34% from 2005 levels by 2030. A number of energy analysts dispute that projection, however, arguing that EPA has not analyzed how efficiency gains at coal plants could lead them to generate more power, pushing aggregate emissions upward. Democrats questioned the assumptions behind the ACE rule and lamented what they saw as a complacent attitude toward climate change from the nominee. "One of the things I don't sense here is a sense of urgency [on climate]," Carper said. "I'm looking for some passion here and I'm not feeling it and that's deeply troubling." Capitol Police arrested multiple protestors after their chants in the hallway of the Dirksen building interrupted Wheeler's testimony. Despite Democrat criticism, Wheeler is likely be confirmed to the EPA's top job, as both the EPW Committee and Senate voted last year to approve his nomination to the No. 2 post. The committee and full Senate are more solidly Republican after GOP gains in the 2018 election — notably Sen. Kevin Cramer, R-N.D., and Sen. Mike Braun, R-In., two new EPW members who beat Democrat incumbents in the fall. After the hearing, Committee Chairman John Barrasso, R-Wy., said the committee expects to hold a vote on Wheeler's confirmation in early February to give the nominee ample time to respond to questions for the record during the government shutdown. Most EPA staff are not able to work during the shutdown, now in its fourth week, but Wheeler was permitted by the Office of Management and Budget to use some workers to prepare for his hearing. "This work constitutes an excepted activity that may continue during the lapse in appropriations," OMB General Counsel Mark R. Paoletta wrote to the agency, according to an email supplied to Utility Dive by EPA. Whether Wheeler will be able to use that staff to help him respond to questions for the record remains unclear, however, and EPA did not respond to an inquiry on that issue. Democrats said they would send a number of lengthy questions for the nominee, including more questions on his previous work as a lobbyist for Murray Energy, a large coal mining company. "With the government shutdown I think it's a challenge," Carper said. "It's a challenge anyway so we'll see. I want to make sure he has time to fully respond to the questions. He's going to get a lot of questions."